According to 17th century divine James Ussher, Archbishop of Armagh, the world was created on this day, a Saturday, at nightfall, or 6 PM. Recent evidence indicates all of the "Bible-based" creation date calculations (generally determined to be ca. 4000 B.C.) are "slightly" off - by at least fifteen billion years. Blanche Scott became the first woman to fly solo in a public airplane flight. In the first use of aircraft in war, Captain Carlo Piazza, an Italian pilot, took off from Libya to survey Turkish lines during the Turco-Italian War. Died, John Boyd Dunlop, Scottish inventor, founder of the Dunlop rubber company. In 1888, he developed commercially practical pneumatic tires, at a crucial time in the development of automobile transportation. K. Reinmuth discovered asteroid #987 Wallia. W. Baade discovered asteroid #1036 Ganymed. Jean and Jeanette Piccard (husband and wife) attained a record balloon height of 10.9 miles (17.5 km) in a flight over Lake Erie. Goethe Link Observatory discovered asteroids #2024 McLaughlin and #2488 Bryan. 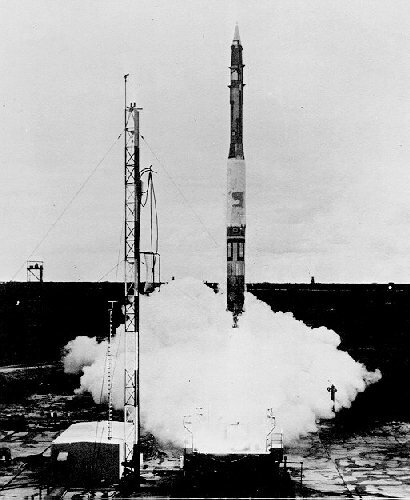 The first test firing of the full Vanguard satellite launch vehicle stack, TV-2, lifted a 2 ton dummy payload to 109 miles (175 km), traveling down range 335 miles (539 km), using two inert upper stages. The US Air Force Discoverer 33 satellite failed to achieve polar orbit because of a premature launch vehicle shutdown. US Air Force Major Robert A. Rushworth flew X-15A VO Stability test mission # 73 to an altitude of 40.996 km and a maximum speed of 5980 (Mach 5.47). USSR's Venera 10 entered orbit about Venus, and the landing probe separated from the orbiter, in preparation for its descent to the surface. Harvard College discovered asteroids #2051 Chang and #2549 Baker. Paleontologist Elso Barghoorn announced that 3.4 billion year old one-celled fossils, the earliest known life forms, had been discovered. A. Mrkos discovered asteroid #2559; Purple Mountain Observatory discovered asteroids #2903 and #3024; T. Seki discovered asteroid #2571 Geisei..
NASA's Apollo 9 Lunar Module ascent stage re-entered the Earth's atmosphere, twelve and a half years after its operational testing in Earth orbit. B. A. Skiff discovered asteroid #3637; C. and E. Shoemaker discovered asteroid #3700 Geowilliams. NASA's STS 34 (Atlantis 5, Shuttle 31, 62nd US manned mission) ended after carrying the Galieo Jupiter probe and the Shuttle Solar Backscatter Ultraviolet (SSBUV) experiment to orbit. On a Saturday afternoon, Brazil launched its first space vehicle, the two-stage rocket VSB-30 (Brazilian Exploration Vehicle), to an apogee of 240 km from the Alcantara launch site in Maranhao, about 1,700 miles north of Rio de Janeiro. The International Space Station (ISS) Expedition 9 crew and their visitor returned to Earth in Soyuz TMA-4.